PAGE, JOSEPH E.Age, 28 years. 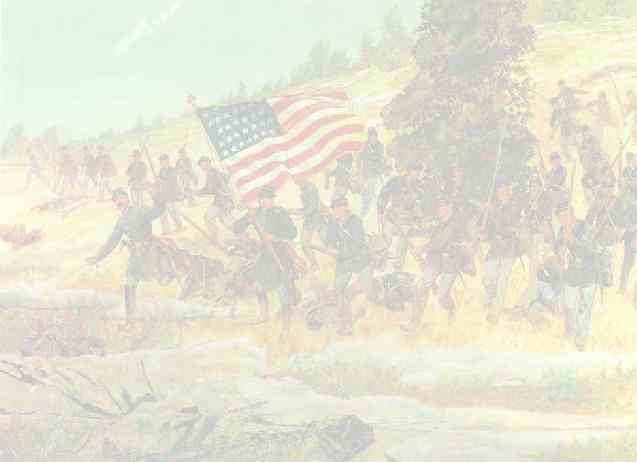 Enlisted, September 17, 1864, at Mt. Morris; mustered in as private, Co. I, September 17, 1864, to serve one year; discharged, June 23, 1865, at Tarboro, N.C. PAGE, LOUIS.Age, 30 years. Enlisted as private, Co. F, February 9, 1863, at Fort Covington, to serve three years; deserted, prior to muster in of company, April 28, 1863. PAGE, WILLIAM.Age, 36 years. Enlisted as private, August 11, 1863, at Buffalo, to serve three years; name erased on muster-in roll of Co. K; no further record. PAINE, THOS. H., see Payne, Thos. H.
PALEN, SIDNEY.Age, 18 years. Enlisted, August 17, 1862, at Fulton; mustered in as private, Co. A, November 19, 1862, to serve three years; missing in action, April 20, 1864, at Plymouth, N.C.; escaped and rejoined his company at Goldsboro, N.C., date not recorded; mustered out with company, July 19, 1865, at Raleigh, N.C.
PALLOCK, JOHN.Age, 21 years. Enlisted, September 14, 1863, at Buffalo; mustered in as private, Co. K, September 25, 1863, to serve three years; deserted, October 3, 1863, from Staten Island. PALMER, ANDREW R.Age, 23 years. Enlisted, July 22, 1863, at Buffalo; mustered in as sergeant, Co. H, August 27, 1863, to serve three years; mustered in as second lieutenant, Co. M, December 25, 1864; first lieutenant Co. D, to date April 9, 1865; mustered out with company, July 19, 1865, at Raleigh, N.C.; prior service in Twenty-first New York Volunteers. Commissioned second lieutenant, October 31, 1864, with rank from October 24, 1864, vice Ketchum, promoted; first lieutenant, April 22, 1865, with rank from January 19, 1865, vice Turner, promoted. PALMER, ANTHONY.Age, 49 years. Enlisted, April 13, 1864, at New Berne, N.C.; mustered in as chaplain, April 13, 1864, to serve three years; honorably discharged, May 30, 1865. Not commissioned. PALMER, GEORGE.Age, 32 years. Enlisted, August 15, 1862, at Oswego; mustered in as private, Co. A, August 19, 1862, to serve three years; appointed corporal, May 20, 1863; sergeant, August 24, 1863; mustered out with company, July 19, 1865, at Raleigh, N.C.
PALMER, GEO. B.Age, 41 years. Enlisted, January 15, 1863, at Buffalo; mustered in as private, Co. L, January 16, 1863, to serve three years; no further record. PALTHY, SAMUEL.Age, 32 years. Enlisted as a private, Co. G, June 16, 1863, at Troy, to serve three years; name erased from muster-in roll of company. PANGBURN, CHAS. C.Age, 31 years. Enlisted, August 19, 1862, at Fulton; mustered in as private, Co. A, November 19, 1862, to serve three years; no further record. PARCELLS, STEPHEN H.Age, not stated. Enlisted, September 15, 1864, at Kingston; mustered in as private, Co. K, September 15, 1864, to serve one year; died, April 17, 1865, of wounds received near Goldsboro, N.C.
PARKER, FRANK C.Age, 32 years. Enlisted, August 21, 1862, at Volney; mustered in as private, Co. B, November 19, 1862, to serve three years; appointed commissary sergeant, same date; reduced to the ranks, May 20, 1863; appointed sergeant, March 1, 1864; died of disease, October 26, 1864, at Bachelors creek, N.C.
PARKER, JOHN.Age, 22 years. Enlisted, December 1, 1862, at New York; mustered in as private, "unassigned," December 1, 1862, to serve three years; no further record. PARKER, JOSEPH.Age, 21 years. Enlisted, November 11, 1862, at Buffalo; mustered in as private, Co. D, November 12, 1862, to serve three years; no further record. PARKER, WILLIAM R.Age, 19 years 8 months. Enlisted, three years. no further record. PARKHURST, JOEL R.Age, 23 years. Enlisted, August 14, 1862, at Fulton; mustered in as private, Co. A, November 19, 1862, to serve three years; no further record. PARKS, JAMES. C.Age, 21 years. Enlisted, March 21, 1863, at Buffalo; mustered in as corporal, Co. B, March 31, 1863, to serve three years; transferred to Co. E, April 9, 1863; to Co. D, May 20, 1863; appointed sergeant, September 16, 1863; mustered in as second lieutenant, Co. A, to date March 1, 1865; mustered out with company, July 19, 1865, at Raleigh, N.C. Commissioned second lieutenant, April 22,1 865, with rank from March 1, 1865, vice Mosher, promoted. PARMELE, JOSEPH.Age, 26 years. Enlisted, November 16, 1862, at Poughkeepsie; mustered in as hospital steward, December 12, 1862, to serve three years; mustered out with company, July 19, 1865, at Raleigh, N.C.
PARR, THOMAS.Age, 22 years. Enlisted, July 30, 1863, at Buffalo; mustered in as private, Co. K, September 10, 1863, to serve three years; appointed corporal, July 5, 1864; reduced December 27, 1864; mustered out with company, July 19, 1865, at Raleigh, N.C.
PARRETT, CHRISTOPHER.Age, 36 years. Enlisted, November 18, 1862, at Buffalo; mustered in as private, Co. E, November 18, 1862, to serve three years; transferred to Co. D, May 20, 1863; mustered out with company, July 19, 1865, at Raleigh, N.C.; also borne as Parrott. PARSONS, AMOS.Age, 31 years. Enlisted, September 20, 1864, at Rochester; mustered in as private, Co. K, September 20, 1864, to serve one year; captured. April 11, 1865, at Faison Station; released, April 15, 1865; discharged, July 6, 1865, at New York city. PARSONS, WILLIAM.Age, 25 years. Enlisted as a private, "unassigned," November 26, 1862, at Hudson, to serve three years; no further record. PARTELL, MICHAEL, see Portell, Michael. PARY, WILLIAM.Age, 24 years. Enlisted, September 26, 1864, at Avon; mustered in as private, "unassigned," September 26, 1864, to serve one year; no further record. PATCHEN, JOHN.Age, 39 years. Enlisted, October 8, 1864, at Avon; mustered in as private, Co. L. October 8, 1864, to serve one year; mustered out with company, July 19, 1865, at Raleigh, N.C.
PATRICK, ALBERT.Age, 27 years. Enlisted, August 14, 1862, at Fulton; mustered in as private, Co. A, November 19, 1862, to serve three years; no further record. PATRICK, FAIRFIELD M.Age, 25 years. Enlisted, June 10, 1863, at Syracuse; mustered in as corporal, Co. G, August 7, 1863, to serve three years; reduced and appointed saddler, September 15, 1863; discharged for disability, June 1, 1864, at New York. PATRICK, JOHN W.Age, 29 years. Enlisted, August 21, 1862, at Granby; mustered in as sergeant, Co. B, November 19, 1862, to serve three years; reduced, May 20, 1863; appointed sergeant, September 15, 1863; discharged for disability, March 18, 1865, from General Hospital, New Berne, N.C.
PATTEN, HENRY R.Age, 21 years. Enlisted, September 22, 1863, at Buffalo; mustered in as first sergeant. Co. L, September 25, 1863, to serve three years; deserted, September 26, 1863, at Buffalo; returned to duty, October 31, 1863; appointed corporal, July 9, 1864; captured, August 10, 1864; near Deep Gully, N.C.; mustered out with company, July 19, 1865, at Raleigh, N.C.
PATTEN, WILLIAM.Age, not stated. Enlisted, February 16, 1863, at Ogdensburg; mustered in as private, "unassigned," March 31, 1863, to serve three years; transferred to Co. C, May 20, 1863; captured, August 14, 1863, at Washington, N.C.; deserted, November 16, 1863, from De Camp General Hospital, New York Harbor. PATTERSON, JOHN.Age, 21 years. Enlisted, September 13, 1864, at Williamstown; mustered in as private, "unassigned," September 13, 1864, to serve one year; no further record. PAUSCH, OTTO R.Age, 30 years. Enlisted, November 26, 1862, at Plattsburgh; deserted, prior to muster in of Co. F, April 28, 1863. PAUTLON, JOHN.Age, 21 years. Enlisted, December 10, 1862, at Buffalo; mustered in as private, Co. E, December 10, 1862, to serve three years; no further record. PAYNE, THOMAS H.Age, 22 years. Enlisted as substitute, September 8, 1864, at New York city; mustered in as private, Co. G, September 8, 1864, to serve one year; transferred to Co. C, December 1, 1864; died of disease, May 21, 1865, in Field Hospital, Greensboro, N.C.; also borne as Paine. PEACE, LOVE J.Age, 33 years. Enlisted, February 15, 1864, at New York city; mustered in as private, "unassigned," February 15, 1864, to serve three years; no further record. PEAK, JAMES.Age, 37 years. Enlisted, August 21, 1862, at Volney; mustered in as private, Co. B, November 19, 1862, to serve three years; mustered out with company, July 19, 1865, at Raleigh, N.C.; also borne as Peek. PEAL, GEORGE.Age, 26 years. Enlisted, as a private, "unassigned," December 8, 1862, at Hudson, to serve three years; no further record. PEASE, GEORGE S.Age, 22 years. Enlisted, December 17, 1862, at Syracuse; mustered in as quartermaster sergeant, Co. B, March 31, 1863, to serve three years; no further record. PECK, FRANKLIN.Age, 21 years. Enlisted, June 27, 1863, at New York; mustered in as private, Co. I, September 2, 1863, to serve three years; appointed sergeant, date not stated; wounded in action, November 20, 1863, near James River, N.C.; reduced to ranks, July 22, 1864; appointed corporal, February 16, 1865; sergeant, June 10, 1865; absent, undergoing sentence of general court-martial at Raleigh, N.C., at date of muster out of company, July 19,1865; prior service in Twenty-eighth New York Infantry. PEDRO, FRANCIS, see Petro, Francis. PEER, STEPHEN.Age, 23 years. Enlisted, November 28, 1862, at Buffalo; mustered in as private, Co. E, November 29, 1862, to serve three years; no further record. PEMBELTON, DANIEL, see Pemelton, Daniel. PEMBERTON, JOHN.Age, 32 years. Enlisted, October 26, 1863, at Buffalo; mustered in as trumpeter, Co. M, November 24, 1863, to serve three years; mustered out, May 26, 1865, at McDougall General Hospital, New York Harbor. PEMELTON, DANIEL.Age, 19 years. Enlisted, October 30, 1863, at Niagara; mustered in as private, Co. M, November 24, 1863, to serve three years; mustered out with company, July 19, 1865, at Raleigh, N.C.; also borne as Pembelton. PENTLAND, GEORGE.Age, 38 years. Enlisted, November 26, 1862, at Plattsburgh; mustered in as private, Co. F, April 28, 1863, to serve three years; captured during raid at Tarboro, N.C., date not stated; paroled, date not stated; returned to company, November 11, 1863; captured, April 20, 1864, at Plymouth, N.C.; died on or about October 1, 1864, at Andersonville, Ga.
PERKINS, GEORGE.Age, 28 years. Enlisted, August 24, 1863, at Buffalo; mustered in as private, Co. L, September 25, 1863, to serve three years; deserted, October 3, 1863, from Staten Island. PERKINS, WILLIAM.Age, 22 years. Enlisted, September 10, 1862, at Hudson; mustered in as private, Co. C, February 17, 1863, to serve three years; appointed sergeant, September 10, 1862; reduced to ranks, May 18, 1863; mustered out, June 23, 1865, at Greensboro, N.C.
PERNTO, JOSEPH.Age, 23 years. Enlisted, September 23, 1863, at Buffalo; mustered in as private, Co. L, September 25, 1863, to serve three years; appointed wagoner, date not stated; reduced, date not stated; discharged, May 17, 1864, to enter United States Navy. PERON, PHILIP.Age, 18 years. Enlisted, as a private, "unassigned," July 23, 1863, at Troy, to serve three years; no further record. PERRAULT, LEWIS.Age, 21 years. Enlisted, November 28, 1862, at Buffalo; mustered in as private, Co. D, November 28, 1862, to serve three years; no further record. PERRY, ANDREW.Age, 22 years. Enlisted, February 20, 1864, at Granby; mustered in as private, Co. B, February 20, 1864, to serve three years; mustered out with company, July 19, 1865, at Raleigh, N.C.
PERRY, DANIEL.Age, 34 years. Enlisted, February 9, 1863, at Albany; mustered in as sergeant, Co. C, February 25, 1863, to serve three years; reduced, December 1, 1863; appointed sergeant, January 1, 1864; first sergeant, January 9, 1865; reduced, April 29, 1865; mustered out with company, July 19, 1865, at Raleigh, N.C.; also borne as Daniel F.
PERRY, EDWARD.Age, 25 years. Enlisted, September 25, 1863, at Buffalo; mustered in as wagoner, Co. L, September 25, 1863, to serve three years; reduced, October 1, 1863; appointed corporal, January 20, 1865; sergeant, June 10, 1865; mustered out with company, July 19, 1865, at Raleigh, N.C.; also borne as Terry, Edward M.
PERRY, WILLIAM.Age, 21 years. Enlisted, August 16, 1862, at Fulton; mustered in as private, Co. A, November 19, 1862, to serve three years; deserted, November 20, 1862; arrested and restored to duty, June 24, 1864, with loss of pay, etc; mustered out with company, July 19, 1865, at Raleigh, N.C.
PETERS, FRANCIS W.Age, 23 years. Enlisted in Co. E, December 10, 1862, at Charlton, to serve three years; deserted, previous to muster in of company, March 31, 1863. PETERS, JOHN.Age, 20 years. Enlisted, March 18, 1863, at New York; mustered in as private, Co. F, April 28, 1863, to serve three years; missing in action, April 20, 1864, at Plymouth, N.C.; died on or about October 18, 1864, at Andersonville, Ga.
PETERSON, NICHOLAS.Age, 22 years. Enlisted, August 20, 1862, at Oswego; mustered in as private, Co. A, November 19, 1862, to serve three years; appointed corporal, May 20, 1863; sergeant, November 16, 1863; captured, April 20, 1864, at Plymouth, N.C.; paroled February, 1865, at Annapolis, Md. ; appointed commissary sergeant, date not stated; mustered out with company, July 19, 1865, at Raleigh, N.C.
PETRO, FRANCIS.Age, 40 years. Enlisted, November 3, 1862, at Hudson; mustered in as private, Co. C, February 17, 1862, to serve three years; captured, August 14, 1863, at Washington, N.C.; died October 30, 1864, in Andersonville prison, Ga.; also borne as Pedro. PHILIPS, DEE DANKEL.Age, 35 years. Enlisted, March 17, 1863, at Buffalo, to serve three years; name erased from muster-in roll of Co. M.
PHILLIPI, JOHN.Age, 19 years. Enlisted, August 19, 1863, at Buffalo; mustered in as private, Co. H, August 27, 1863, to serve three years; died of disease, January 6, 1865, in General Hospital, New Berne, N.C.
PHILLIPI, SAMUEL.Age, 20 years. Enlisted, July 21, 1863, at Buffalo; mustered in as private, Co. H, August 27, 1863, to serve three years; captured, March 8, 1865, at Wises Forks, N.C.; returned to duty, June 20, 1865; mustered out with company, July 19, 1865, at Raleigh, N.C.
PHILLIPS, JAMES.Age, 25 years. Enlisted, August 4, 1863, at New York city; mustered in as commissary sergeant, Co. M, November 24, 1863, to serve three years; reduced; February 11, 1864; appointed corporal, June 27, 1864; captured, March 29, 1865; released, May 5, 1865; mustered out, June 24, 1865, at New York city; prior service in Fourth New York Infantry. PHILLIPS, JOHN.Age, 35 years. Enlisted, July 20, 1863, at Troy; mustered in as private, Co. I, September 2, 1863, to serve three years; appointed blacksmith, date not stated; reduced, date not stated; appointed corporal, May 10, 1865; mustered out with company, July 19, 1865, at Raleigh, N.C.; also borne as John E. Phillips. PHILLIPS, WILLIAM.Age, 19 years. Enlisted, July 27, 1863, at Buffalo; mustered in as private, Co. H, August 27, 1863, to serve three years; captured, March 8, 1865, at Wises Forks, N.C.; returned to duty, June 20, 1865; mustered out with company, July 19, 1865, at Raleigh, N.C.
PIERCE, LYMAN G.Age, 28 years. Enlisted, September 10, 1864, at Albany; mustered in as private, Co. L, September 13, 1864, to serve one year; captured, April 4, 1865, at Hookerton, N.C.; released May 5, 1865; mustered out, July 3, 1865, at New York city. PIERSON, ANDREW J.Age, 27 years. Enrolled, September 10, 1863, at Buffalo; mustered in as second lieutenant, Co. K, September 10, 1863, to serve three years; first lieutenant, April 10, 1864; mustered out with company, July 19, 1865, at Raleigh, N.C. Commissioned second lieutenant, November 20, 1863, with rank from September 1, 1863, original; first lieutenant, March 30, 1864, with rank from February 11, 1864, vice Ashford, dismissed. PINE, J., see Prine, Josiah. PIRATE, CHRISTOPHER.Age, 36 years. Enlisted, November 18, 1862, at Buffalo; mustered in as private, Co. H, November 18, 1862, to serve three years; no further record. PITCHER, WILLIAM.Age, 26 years. Enlisted, January 4, 1864, at Poughkeepsie; mustered in as private, Co. K, January 4, 1864, to serve three years; mustered out with company, July 19, 1865, at Raleigh, N.C.
PITTMAN, AUGUSTUS.Age, 21 years. Enlisted, January 29, 1863, at New York city; mustered in as sergeant, co. C, February 17, 1863, to serve three years; appointed first sergeant, April 25, 1863; mustered in as second lieutenant to date January 25, 1864; killed in action, March 8, 1865. Commissioned second lieutenant, January 8, 1864, with rank from November 5, 1863; vice Titus, discharged; first lieutenant, February 28, 1865, with rank from December 1, 1864, vice Ward, killed; not mustered. POGNET, JOHN.Age, 33 years. Enlisted at Copake, as a private, in Co. E, October 30, 1862, to serve three years; died, December 15, 1862, prior to muster in of company. POLAND, EDWIN A.Age, 25 years. Enlisted, August 15, 1862, at Oswego; mustered in as private, Co. A, November 19, 1862, to serve three years; mustered out, to date December 13, 1862, for promotion to first lieutenant, Co. H; borne on muster-in roll of Co. H, as first lieutenant, with remark, "mustered in at Albany, December 13, 1862, while organizing in First and Seventh Senate districts;" no other evidence of muster-in; enrolled, July 25, 1863, at Syracuse; mustered in as second lieutenant, Co. G, August 7, 1863, to serve three years; first lieutenant, Co. E, February 13, 1864; mustered out with company, July 19, 1865, at Raleigh, N.C. Commissioned second lieutenant, November 20, 1863, with rank from July 29, 1863, original; first lieutenant, March 30, 1864, with rank from February 2, 1864, vice Sturgeon, discharged. POOLE, ROBERT.Age, 23 years. Enlisted, January 4, 1864, at Volney; mustered in as private, "unassigned," January 31, 1864, to serve three years; no further record. POPPEL, WILLIAM.Age, 26 years. Enlisted, July 16, 1863, at New York; to serve three years; Co. I, September 2, 1863, to serve three years; appointed corporal, date not stated; reduced, June 19, 1864; reappointed, June 10, 1865; mustered out with company, July 19, 1865, at Raleigh, N.C.
POPPENBURG, FRED.Age, 39 years. Enlisted, March 17, 1863, at Buffalo; mustered in as private, Co. B, March 31, 1863, to serve three years; transferred to Co. E, May 20, 1863; appointed corporal, January 9, 1865; mustered out with company, July 19, 1865, at Raleigh, N.C.
PORTELL, MICHAEL.Age, 19 years. Enlisted, August 25, 1863, at Troy; mustered in as private, Co. I, September 2, 1863, to serve three years; appointed corporal, June 2, 1865; mustered out with company, July 19, 1865, at Raleigh, N.C.; also borne as Partell. POST, GILES.Age, 18 years. Enlisted, September 15, 1864, at Williamstown; mustered in as private, Co. C, September 15, 1864, to serve one year; mustered out, June 23, 1865, at Greensboro, N.C.
POTTER, FLORENCE A.Age, 21 years. Enlisted, April 27, 1863, at Syracuse; mustered in as corporal, Co. G, August 7, 1863, to serve three years; reduced, October 24, 1863; mustered out with company, July 19, 1865, at Raleigh, N.C.
POTTER, GEO. C.Age, 21 years. Enlisted, November 17, 1863, at Buffalo; mustered in as private, Co. M, November 24, 1863, to serve three years; appointed corporal, date not stated; reduced to ranks, November 20, 1864; mustered out with company, July 19, 1865, at Raleigh, N.C.
POTTER, THOMAS.Age, 24 years. Enlisted, February 20, 1863, at Ogdensburg; mustered in as private, Co. E, March 31, 1863, to serve three years; no further record. POTTER, WILLIAM.Age, 19 years. Enlisted, February 16, 1863, at Ogdensburg; mustered in as private, Co. E, March 31, 1863, to serve three years; deserted, November 16, 1863, at New York city; reported as of Co. C.
POTTS, ADAM.Age, 22 years. Enlisted, November 2, 1864, at Hartsville; mustered in as private, Co. D, November 2, 1864, to serve three years; transferred to Co. A, November 26, 1864; reported as in Northern Hospital upon muster out of company, July 19, 1865. POTTS, GEORGE.Age, 22 years. Enlisted, August 14, 1862, at Fulton; mustered in as private, Co. A, November 19, 1862, to serve three years; discharged, November 27, 1892, for promotion as second lieutenant, Twenty-first New York Battery. POWERS, ALEXANDER.Age, 18 years. Enlisted, march 11, 1864, at Troy; mustered in as private, "unassigned," March 11, 1864, to serve three years; no further record. POWERS, JAMES.Age, 41 years. Enlisted, January 10, 1863, at Buffalo; mustered in as private, Co. L, January 12, 1863, to serve three years; transferred to Co. E, May 20, 1863; discharged for disability, June 20, 1863. POWERS, PATRICK.Age, 34 years. Enlisted, December 6, 1862, at Buffalo; mustered in as private, Co. L, December 7, 1862, to serve three years; no further record. PRATT, DOUGLASS H.Age, 18 years. Enlisted, as private, "unassigned," December 19, 1862, at Albany, to serve three years; no further record. PRATT, JOHN C.Age, 23 years. Enlisted, April 29, 1863, at New York city; mustered in as private, Co. F, April 29, 1863, to serve three years; deserted, May 30, 1863, from Camp Washington, Staten Island. PRATT, WELLINGTON E.Age, 19 years. Enlisted, September 14, 1864, at Phelps; mustered in as private, Co. B, September 14, 1864, to serve one year; mustered out, June 23, 1865, per General Order No. 83. PRATT, WILLIAM.Age, 19 years. Enlisted, December 10, 1864, at Ellery; mustered in as private, Co. C, December 10, 1864, to serve three years; mustered out with company, July 19, 1865, at Raleigh, N.C.
PREBLE, JAMES.Age, 22 years. Enlisted, September 8, 1863, at Buffalo; mustered in as private, Co. K, September 10, 1863, to serve three years; shot, March 31, 1865, by sentence general court-martial, at Goldsboro, N.C.; prior service in Forty-ninth New York Volunteers. PRENTICE, SIMEON.Age, 42 years. Enlisted, November 8, 1862, at Linden; mustered in as private, Co. E, March 31, 1863, to serve three years; transferred to Co. C, May 20, 1863; to Invalid Corps, September 18, 1863; also borne as Prentiss. PRENTISS, THOMAS.Age, 21 years. Enlisted, in Co. M, September 10, 1863, at New York city; name crossed from muster-in roll, no further record. PRESBREY, WILLIAM N.Age, 34 years. Enlisted, January 31, 1863, at Buffalo; mustered in as private, Co. E, January 31, 1863, to serve three years; no further record. PRESTON, ANSON.Age, 18 years. Enlisted, December 30, 1862, at Buffalo; mustered in as private, Co. D, December 30, 1862, to serve three years; reported as transferred from Co. G to D, May 20, 1863; killed by explosion, May 26, 1864, at Camp Classon, N.C.; also borne as Preuster. PREUSTER, ANSON, see Preston, Anson. PRICE, ANDREW.Age, 21 years. Enlisted, August 10, 1863, at New York; mustered in as private, Co. I, September 2, 1863, to serve three years; transferred to Co. A, January 1, 1865; mustered out with company, July 19, 1865, at Raleigh, N.C.
PRICE, GEORGE.Age, 22 years. Enlisted, January 5, 1863, at Buffalo; mustered in as blacksmith, Co. D, January 5, 1863, to serve three years; transferred to Co. D, May 20 1863; mustered out with company, July 19, 1865, at Raleigh, N.C.
PRIM, ADAM.Age, 19 years. Enlisted, November 22, 1862, at Holland; mustered in as private, Co. H, November 22, 1862, to serve three years; no further record. PRINCE, WILLIAM D.Age, 22 years. Enlisted, August 24, 1863, at Buffalo; mustered in as corporal, Co. K, September 10, 1863, to serve three years; reduced, March 1, 1864; mustered out with company, July 19, 1865, at Raleigh, N.C.; prior service in Twenty-first New York Volunteers. PRINE, JOSEPH.Age, 21 years. Enlisted, September 30, 1863, at Buffalo; mustered in as private, Co. M, November 24, 1863, to serve three years; appointed sergeant, same date; reduced, June 4, 1864; captured, August 10, 1864; paroled, date not stated; returned to duty, June 14, 1865; mustered out, June 21, 1865, at Elmira; prior service in Twenty-first New York Infantry; also borne as Pine, J.
PROUT, AURION T.Age, 23 years. Enlisted, July 27, 1864, at Troy; mustered in as private, "unassigned," July 27, 1864, to serve three years; no further record. PRUER, WOLFGANG.Age, 42 years. Enlisted, December 26, 1862, at Buffalo; mustered in as private, Co. F, December 27, 1862, to serve three years; transferred to Co. E, May 20, 1863; died, October 26, 1864, in Regimental Hospital, at Camp Palmer, N.C.
PULVER, DAVID H.Age, 29 years. Enlisted, September 3, 1864, at Troy; mustered in as private, Co. C, September 3, 1864, to serve one year; captured, March 21, 1865, at Goldsboro, N.C.; mustered out, June 23, 1865, at Greensboro, N.C.
PURDY, DAVID.Age, 24 years. Enlisted, September 5, 1864, at Poughkeepsie; mustered in as private, Co. F, September 5, 1864, to serve one year; mustered out, June 23, 1865, at Tarboro, N.C.
PURDY, THOMAS.Age, 24 years. Enlisted, January 28, 1863, at Buffalo; mustered in as private, Co. E, January 28, 1863, to serve three years; no further record. QUEEN, JOHN, see Quinn, John. QUINN, JOHN. - Age, 25 years. Enlisted, August 30, 1862, at Oswego; mustered in as private, Co. B, November 19, 1862, to serve three years; sick in General Hospital, Troy, N.Y., upon muster out of company, July 19, 8165; also borne as Queen; no further record. QUINN, PATRICK. - Age, 31 years. Enlisted, December 2, 1862, at Buffalo; mustered in as private, Co. D, December 2, 1862, to serve three years; no further record. QUINN, MICHAEL. - Age, 28 years. Enlisted, January 3, 1863, at Buffalo; mustered in as private, Co. D, January 3, 1863, to serve three years; appointed corporal, April 16, 1863; transferred to Co. A, May 20, 1863; captured at Tarboro, N.C., July 20, 1863; paroled, no date given; missing in action, at Plymouth, N.C., April 20, 1864; died, while prisoner of war, no date given, at Andersonville, Ga.
QUALY, MICHAEL. - Age, 24 years. Enlisted, October 21, 1863, at New York city; mustered in as private, Co. M, November 24, 1863, to serve three years; transferred to Co. A, January 1, 1865; killed in action, March 8, 1865, at Kingston, N.C.
RABSRMANN, HENRY.Age, 39 years. Age, August 25, 1863, at Buffalo; mustered in as private, Co. K, September 10, 1863, to serve three years; died of disease, November 7, 1864, at Camp Palmer, N.C.; prior service in One Hundredth New York Volunteers. RAIGNAL, A. J., see Raynoll, Augusta J.
RALIGH, WILLIAM, see Rawley, William. RALSTON, JOHN.Age, 19 years. Enlisted, September 9, 1864, at Syracuse; mustered in as private, Co. A, September 9, 1864, to serve one year; discharged, June 23, 1865, per General Order No. 83. RAMIER, LOUIS, see Renier, Louis. RAMSDALE, RUSSELL.Age, 35 years. Enlisted, August 13, 1862, at Fulton; mustered in as private, Co. A, November 19, 1862, to serve three years; appointed armorer, December 26, 1863; appointed bugler, no date given; mustered out, July 18, 1865, at McDougall General Hospital, New York Harbor; also borne as Ramsdell. RANDALL, CHARLES S.Age, 44 years. Enlisted, September 21, 1864, at Conesus; mustered in as private, Co. L, September 21, 1864, to serve one year; mustered out, June 20, 1865, under General Order No. 85, War Department. RANSOM, CHARLES.Age, 25 years. Enlisted, June 30, 1863, at Oswego; mustered in as private, Co. I, September 2, 1863, to serve three years; deserted, September 22, 1863, from Staten Island. RAWLEY, WILLIAM.Age, 34 years. Enlisted, July 24, 1863, at Troy; mustered in as private, Co. I, September 2, 1863, to serve three years; appointed corporal, February 16, 1865; in arrest from May 17, 1865, under sentence of general court-martial, to forfeit $10 per month for two months; mustered out with company, July 19, 1865, at Raleigh, N.C.
RAY, MARTIN.Age, not stated. Enlisted, September 30, 1864, at West Seneca; mustered in as private, Co. D, September 30, 1864, to serve three years; captured, March 23, 1865; released, April 9, 1865; mustered out, June 30, 1865, at New York city. RAYMOND, ROBERT.Age, 23 years. Enlisted, March 17, 1863, at Buffalo; mustered in as private, Co. B, March 31, 1863, to serve three years; no further record. RAYNELL, AUGUSTA J.Age, 29 years. Enlisted, September 29, 1864, at Ossian, mustered in as private, Co. B, September 29, 1864, to serve one year; mustered out, June 23, 1865, per General Order No. 83, War Department; also borne as Raignell and Raignall. READY, JOHN.Age, 23 years. Enlisted, December 1, 1862, at West Troy; mustered in as private, Co. E, March 31, 1863, to serve three years; no further record. REDD, TENOS.Age, 33 years. Enlisted, August 21, 1862, at Volney; mustered in as private, Co. B, November 19, 1862, to serve three years; discharged for disability, November 15, 1863, at New Berne, N.C.; also borne as Reed. REDRICK, ANDREW C.Age, 43 years. Enlisted, September 28, 1864, at Aurora; mustered in as private, Co. G, September 28, 1864, to serve three years; deserted, June 22, 1865, at Tarboro, N.C.
REED, BENJAMIN F.Age, 28 years. Enlisted, September 19, 1863, at Buffalo; mustered in as private, Co. L, September 25, 1863, to serve three years; mustered out with company, July 19, 1865, at Raleigh, N.C.
REED, BENJAMIN J.Age, 18 years. Enlisted, December 8, 1862, at Hoosick; mustered in as private, Co. B, March 31, 1863, to serve three years; no further record. REED, FRED, see Wrede, Fred. REED, ISAAC.Age, 24 years. Enlisted, March 25, 1864, at Conesville; mustered in as private, Co. L, March 25, 1864, to serve three years; appointed wagoner, May 15, 1864; absent sick at time of muster out of company, July 19, 1865; no further record. REED, TENOS, see Redd, Tenos. REFFEL, LOUIS.Age, 24 years. Enlisted, January 23, 1863, at Buffalo; mustered in as corporal, Co. F, January 24, 1863, to serve three years; transferred to Co. E, May 20, 1863; appointed sergeant, September 25, 1863; reduced, date not stated; appointed sergeant, January 25, 1865; mustered out with company, July 19, 1865, at Raleigh, N.C.; also borne as Reffle. REIGLER, ANTHONY P.Age, 36 years. Enlisted, November 26, 1862, at Buffalo; mustered in as sergeant, Co. L, November 26, 1862, to serve three years; no further record. REILN, ANDREW.Age, 25 years. Enlisted, December 12, 1862, at New York; mustered in as private, "unassigned," December 12, 1862, to serve three years; no further record. REILY, JOHN, see Riley, John. REINHARD, CASPER.Age, 39 years. Enlisted, August 21, 1863, at Buffalo; mustered in as private, Co. K, September 10, 1863, to serve three years; captured, April 11, 1865; released, April 15, 1865; mustered out, June 30, 1865, at New York city; also borne as Rinehart; prior service in Twenty-first New York Volunteers. RELLEY, MICHAEL.Age, 38 years. Enlisted, March 21, 1863, at Buffalo; mustered in as private, "unassigned," March 21, 1863, to serve three years; no further record. RENIER, LOUIS.Age, 34 years. Enlisted, April 4, 1863, at New York; mustered in as bugler, Co. G, August 7, 1863, to serve three years; prisoner of war from March 23, 1865 to April 2, 1865; discharged, June 21, 1865, at Camp Parole, Annapolis, Md. ; also borne as Ramier. RENSSELAER, LESTER, see Lester, Rensselaer. REYNOLDS, CHARLES.Age, 21 years. Enlisted, November 11, 1862, at Buffalo; mustered in as private, Co. D, November 11, 1862, to serve three years; no further record. REYNOLDS, JOSEPH.Age, 38 years. Enlisted, August 24, 1863, at New York city, to serve three years; prior service in Fourth New York Volunteers; name erased from muster-in roll of Co. M; no further record. REYNOLDS, MARTIN.Age, 31 years. Enlisted in Co. E, December 20, 1862, at Albany; deserted, previous to muster of company, March 31, 1863. REYNOLDS, SOLON.Age, not given. Enlisted, September 14, 1864, at Phelps; mustered in as private, Co. I, September 14, 1864, to serve one year; captured, March 31, 1865, at Goldsboro; paroled, May 2, 1865, at Camp Chase; mustered out, June 23, 1865, at Camp Chase, O.
REYNOLDS, THOS. B.Age, 26 years. Enlisted, February 2, 1864, at New York city; mustered in as private, Co. C, February 2, 1864, to serve three years; transferred, to Co. I, March 5, 1864; appointed corporal, July 22, 1864; reduced, April 27, 1865; in arrest, undergoing sentence general court-martial, Raleigh, N.C., from May 17, 1865, to forfeit $10 per month for three months; mustered out with company, July 19, 1865, at Raleigh, N.C.; prior service in Sixty-ninth, New York Infantry. REYNOLDS, VILAS.Age, 21 years. Enlisted, February 9, 1863, at Fort Covington; mustered in as private, Co. F, April 28, 1863, to serve three years; killed, August 8, 1863, accidentally shot on post. REVELL, WILLIAM A.Age, 21 years. Enlisted, November 24, 1862, at New York; mustered in as private, "unassigned," November 24, 1862, to serve three years; no further record. RHODES, ISAAC A.Age, 26 years. Enlisted, October 4, 1864, at Nunda; mustered in as private, Co. B, October 4, 1864, to serve one year; mustered out with company, July 19, 1865, at Raleigh, N.C.; also borne as Rose. RHODES, THOMAS.Age, 23 years. Enlisted, August 29, 1864, at Troy; mustered in as private, Co. G, August 29, 1864, to serve one year; discharged, June 23, 1865, per General Order No. 83, War Department; substitute. RICE, JOSEPH.Age, 32 years. Enlisted, November 28, 1862, at Buffalo; mustered in as private, Co. H, November 28, 1862, to serve three years; transferred to Co. D, May 20, 1863; died, July 15, 1864, of gunshot wound received on picket, at Bachelors Creek. RICHARDS, LEWELLYN B.Age, 18 years. Enlisted, August 15, 1862, at Oswego; mustered in as private, Co. A, November 19, 1862, to serve three years; mustered out July 19, 1865, at Beaufort, N.C.
RICHARDS, THOMAS.Age, 24 years. Enlisted, September 21, 1864, at Sullivan; mustered in as private, "unassigned," September 21, 1864; to serve one year. no further record. RICHE, RICHARD.Age, 23 years. Enlisted, August 25, 1863, at Buffalo; mustered in as saddler, Co. L, September 25, 1863, to serve three years; reduced, December, 1863; appointed farrier, June 11, 1864; reduced, September 6, 1864; mustered out, July 8, 1865, at Buffalo, N.Y.
RICHMOND, CHARLES H.Age, 29 years. Enlisted, January 25, 1864, at Poughkeepsie; mustered in as private, "unassigned," January 25, 1864, to serve three years; no further record. RICHOLD, GEORGE.Age, 18 years. Enlisted, August 24, 1863, at Buffalo; mustered in as private, Co. K, September 10, 1863, to serve three years; mustered out, July 3, 1865, at Davids Island, New York Harbor. RICHTER, THEODORE.Age, 36 years. Enlisted, December 5, 1862, at Buffalo; mustered in as corporal, Co. H, December 5, 1862, to serve three years; no further record. RIGHT, GEORGE.Age, 27 years. Enlisted, August 27, 1863, at New York; mustered in as private, Co. I, September 2, 1863, to serve three years; no further record. RIGGS, CHARLES E.Age, 20 years. Enlisted, October 7, 1864, at Mt. Morris; mustered in as private, Co. E, October 7, 1864, to serve one year; mustered out with company, July 19, 1865, at Raleigh, N.C.
RILEY, CHARLES.Age, 21 years. Enlisted, October 23, 1862, at Hudson; mustered in as private, Co. C, February 17, 1863, to serve three years; no further record. RILEY, HENRY.Age, 23 years. Enlisted, August 4, 1863, at Buffalo; mustered in as private, "unassigned," August 4, 1863; to serve three years; no further record. RILEY, JOHN.Age, 26 years. Enlisted, November 24, 1862, at Cambridge; mustered in as corporal, Co. T, March 31, 1862, to serve three years; transferred to Co. B, May 20, 1863; reduced, June 20, 1863; captured, July 20, 1863; released April 21, 1865; mustered out, July 6, 1865, under telegraph order. War Department, May 12, 1865; also borne as Reily. RILLIET, JEAN LOUIS.Age, 25 years. Enlisted, December 8, 1862, at New York; mustered in as private, "unassigned," December 8, 1862, to serve three years; prior service in Eighth United States Infantry; no further record. RINEHART, CASPER. see Reinhard, Casper. RING, CHARLES.Age, 22 years. Enlisted, September 22, 1864, at Poughkeepsie; mustered in as private, Co. M, October 2, 1864, to serve three years; captured, march 10, 1865, paroled, no date given; mustered out with company, July 19, 1865, at Raleigh, N.C.; prior service in First Lincoln Cavalry. RINGLE, AUGUST.Age, 26 years. Enlisted, December 10, 1862, at New York; mustered in as private, "unassigned," December 11, 1862, to serve three years; no further record. RISKER, JOHN A., see Kisker, John A.
ROACH, CHARLES H., see Roche, Charles H.
ROADHOUSE, HENRY.Age, 28 years. Enlisted, January 22, 1863, at New York city; mustered in as private, "unassigned," January 22, 1863, to serve three years; no further record. ROBERTS, FREDK.Age, 30 years. Enlisted, August 3, 1863, at Buffalo; mustered in as private, Co. H, August 27, 1863, to serve three years; appointed corporal, January 11, 1865; captured at Wises Forks, N.C., March 8, 1865; paroled, June 20, 1865; mustered out with company, July 19, 1865, at Raleigh, N.C.; prior service in Twenty-first New York Volunteers. ROBERTS, GEORGE.Age, 21 years. Enlisted, July 13, 1863, at New York; mustered in as private, Co. G, August 7, 1863, to serve three years; deserted, August 27, 1863, at Staten Island, N.Y.
ROBERTS, JESSE.Age, 41 years. Enlisted, September 14, 1864, at Phelps; mustered in as private, Co. I, September 14, 1864, to serve one year; discharged, June 23, 1865, at Tarboro, N.C.
ROBERTSON, GEORGE.Age, 26 years. Enlisted, December 22, 1862, at Buffalo; mustered in as private, Co. E, December 27, 1862, to serve three years; deserted. August 15, 1863, at Plymouth, N.C.
ROBERTSON, JOHN.Age, 22 years. Enlisted, November 28, 1862, at New York; mustered in as private, "unassigned," November 28, 1862, to serve three years; no further record. ROBIN, JOSEPH.Age, 22 years. Enlisted, November 5, 1862, at Troy; mustered in as private, Co. B, March 31, 1863, to serve three years; transferred to Co. C, May 20, 1863; deserted, May 21, 1863, from Staten Island, N.Y.
ROBINSON, GEORGE.Age, 21 years. Enlisted, December 27, 1862, at Buffalo; mustered in as corporal, Co. L, December 27, 1862, to serve three years; appointed sergeant, February 28, 1863; reduced and transferred to Co. E, May 20, 1863; appointed corporal, January 6, 1864; reduced, May 19, 1864; appointed corporal, January 24, 1865; mustered out with company, July 19, 1865, at Raleigh, N.C.
ROBINSON, HENRY O.Age, 22 years. Enlisted, August 19, 1863, at Buffalo; mustered in as corporal, Co. K, September 10, 1863, to serve three years; appointed sergeant, November 23,1 863; reduced to ranks, April 24, 1864; discharged April 29, 1864, for transfer to the Navy. ROBINSON, JOHN.Age, 19 years. Enlisted, December 3, 1862, at New York, to serve three years; name erased from records; no further record. ROBISON, JOSEPH.Age, 18 years. Enlisted, December 15, 1862, at Syracuse; to serve three years; Co. B, March 31, 1863, to serve three years; transferred to Co. E, May 20, 1863; mustered out with company, July 19, 1865, at Raleigh, N.C.
ROBINSON, JOSEPH.Age, 18 years. Enlisted, December 15, 1862, at Syracuse; to serve three years; Co. B, March 31, 1863, to serve three years; no further record. ROBINSON, MILES.Age, 29 years. Enlisted, January 13, 1863, at Oswego; to serve three years; Co. B, March 31, 1863, to serve three years; no further record. ROBINSON, WILLIAM.Age, 23 years. Enlisted, June 31, 1863, at Syracuse; mustered in as corporal, Co. G, August 7, 1863, to serve three years; appointed sergeant, January 9, 1864; reduced, May 15, 1865; mustered out with company, July 19, 1865, at Raleigh, N.C. prior service in Thirty-third New York Volunteers. ROBISON, JOHN R.Age, 22 years. Enlisted, September 12, 1864, at Buffalo; mustered in as private, "unassigned," September 12, 1864, to serve three years; no further record. ROBICHAUD, JOSEPH.Age, 20 years. Enlisted, January 13, 1863, at Buffalo; mustered in as private, Co. L, January 13,1 863, to serve three years; no further record. ROCHE, CHARLES H.Age, 21 years. Enlisted, December 7, 1862, at New York; mustered in as adjutant, March 5, 1863, to serve three years; mustered in as captain, Co. A, September 24, 1863; died of disease, October 17, 1864, at Camp Palmer, N.C.; also borne as Roach. Not commissioned adjutant; commissioned captain, with rank from September 24, 1863, original. RODGERS, MICHAEL H.Age, not given. Enlisted, June 29, 1862, at Washington; to serve three years; Co. C, June 29, 1862, to serve three years; mustered out with company, July 19, 1865, at Raleigh, N.C.
RODGERS, THOMAS.Age, 22 years. Enlisted, November 18, 1862, at Buffalo; mustered in as private, Co. E, November 18, 1862, to serve three years; transferred to Co. D, May 20, 1863; mustered out with company, July 19, 1865, at Raleigh, N.C.
ROGERS, JOSEPH H.Age, 25 years. Enlisted, October 4, 1864, at Buffalo; mustered in as private, Co. K, October 4, 1864, to serve one year; mustered out with company, July 19, 1865, at Raleigh, N.C.
ROGERS, THOS.Age, 44 years. Enlisted, February 16, 1862, at New York; mustered in as corporal, Co. F, April 28, 1863, to serve three years; reduced to ranks, March 5, 1863; captured, July 20, 1863, at Tarboro, N.C.; paroled at Annapolis, Md., November 30, 1863; died, about September 3, 1864, at Andersonville, Ga.
ROLESON, JOHN.Age, 28 years. Enlisted, September 20, 1864, at Corning; mustered in as private, Co. M, September 27, 1864, to serve one year; mustered out, June 23, 1865, under General Order No. 83; also borne as Rollison. ROLE, CHARLES E.Age, 31 years. Enlisted, October 6, 1862, at Claverack; mustered in as saddler, Co. E, March 31, 1863, to serve three years; no further record. ROMAN, CHARLES.Age, 21 years. Enlisted, November 26, 1862, at Buffalo; mustered in as corporal, Co. H, November 26, 1862, to serve three years; appointed sergeant, February 15, 1863; transferred to Co. D, May 20, 1863; reduced to ranks, September 5, 1863; transferred to Fourteenth United States Infantry, February 15, 1864, which organization claimed him as a deserter. ROMAN, ROBERT.Age, 23 years. Enlisted, March 17, 1863, at Buffalo; mustered in as corporal, Co. E, March 18, 1863, to serve three years; transferred to Co. D, May 20, 1863; reduced, date not stated; in arrest, awaiting sentence of court-martial, October, 1863; in confinement at Washington, D.C.; December, 1863; released, date not stated; captured and deserted to the enemy, April 27, 1864. RONEY, CHARLES E.Age, 18 years. Enlisted, October 4, 1862, at Austerlitz; mustered in as private, Co. E, March 31, 1863, to serve three years; transferred to Co. C, May 20, 1863; appointed corporal, no date given; reduced, January 1, 1864; mustered out with company, July 19, 1865, at Raleigh, N.C.; also borne as Rooney. ROOT, HENRY C.Age, 19 years. Enlisted, October 9, 1862, at Austerlitz; mustered in as private, Co. C, February 17, 1863, to serve three years; mustered out with company, July 19, 1865, at Raleigh, N.C.
ROOTH, ROBERT.Age, 27 years. Enlisted, March 20, 1863, at New York; mustered in as corporal, Co. F, April 28, 1863, to serve three years; reduced to ranks, August 8, 1863; captured, April 20, 1864, at Plymouth, N.C.; paroled prisoner, February, 1865, at Annapolis, Md. ; mustered out, June 24, 1865, at Camp Chase, O. ROSE, ISAAC A., see Rhodes, Isaac A.
ROSS, ALBERT.Age, 23 years. Enlisted, June 27, 1863, at New York; mustered in as private, Co. G, August 7, 1863, to serve three years; mustered out with company, July 19, 1865, at Raleigh, N.C.
ROSS, GEORGE B.Age, 21 years. Enlisted, November 4, 1863, at Buffalo; mustered in as private, Co. M, November 24, 1863, to serve three years; appointed commissary sergeant, February 11, 1864; reduced, July 17, 1864; in confinement at muster out of company, July 19, 1865; no further record. ROSS, JAMES.Age, 20 years. Enlisted, July 11, 1863, at Oswego; mustered in as private, Co. I, September 2, 1863, to serve three years; transferred to Navy, May 17, 1864. ROSS, JOHN.Age, 18 years. Enlisted, December 13, 1862, at Buffalo; mustered in as private, Co. G, December 13, 1862, to serve three years; transferred to Co. D, May 20, 1863; transferred to Co. A, January 1, 1865; wounded and in hospital at New Berne, N.C., March 8, 1865; mustered out with company, July 19, 1865, at Raleigh, N.C.
ROSS, PORTER.Age, 19 Years. Enlisted, November 24, 1862, at Buffalo; mustered in as private, Co. H, November 24, 1862, to serve three years; no further record. ROSS, SMITH.Age, 26 years. Enlisted, August 29, 1864, at Bristol; mustered in as private, Co. M, September 2, 1864, to serve one year; appointed blacksmith, October 23, 1864; mustered out with company, July 19, 1865, at Raleigh, N.C.
ROSS, WILLIAM.Age, 28 years. Enlisted, March 5, 1863, at Buffalo; mustered in as private, Co. E, March 5, 1863, to serve three years; no further record. ROSSELL, EDWARD.Age, 22 years. Enlisted, October 27, 1864, at Schoharie; mustered in as private, Co. D, October 27, 1864, to serve three years; transferred to Co. A, November 24, 1864; missing in action, March 8, 1865, at Kingston, N.C.; confined in Libby prison, no date given; released, March 20, 1865, at Aikens Landing, Va.: paroled prisoner, at Annapolis, Md., April, 1865; mustered out June 26, 1865, at Annapolis, Md. ROTE, CHARLES.Age, 31 years. Enlisted, October 6, 1862, at Claverack; mustered in as saddler, Co. D, March 31, 1863, to serve three years; transferred to Co. F, May 20, 1863; captured, July 1863, at Tarboro, N.C.; paroled, December 6, 1863; missing in action, April 20, 1864, at Plymouth, Va.; died December 10, 1864, while prisoner of war, at Charleston, S.C.
ROTHER, ALOIS.Age, 33 years. Enlisted, November 25, 1862, at New York; mustered in as private, "unassigned," November 25, 1862, to serve three years; no further record. ROUGE, WILLIAM.Age, 38 years. Enlisted, January 23, 1863, at New York; mustered in as private, Co. F, April 28, 1863, to serve three years; appointed bugler, date not recorded; missing in action, April 20, 1864, at Plymouth, N.C.; died July 2, 1864, at Andersonville, Ga. ROUSE, JUDSON A., see Royce, Judson A.
ROYCE, CLARENCE.Age, 19 years. Enlisted, September 20, 1864, at Corning; mustered in as private, Co. I, September 20, 1864, to serve one year; discharged, June 23, 1865, at Tarboro, N.C.
ROYCE, JUDSON A.Age, 21 years. Enlisted, September 16, 1864, at Mt. Morris; mustered in as private, Co. I, September 16, 1864, to serve one year; died, March 9, 1865, of wounds received in action; also borne as Rouse. ROYN, JOHN.Age, 23 years. Enlisted, November 24, 1862, at Albany; mustered in as private, Co. E, March 31, 1863, to serve three years; no further record. ROZELLE, GEORGE.Age, 45 years. Enlisted, August 14, 1862, at Oswego; mustered in as private, Co. A, November 19, 1862, to serve three years; no further record. RUDE, HIRAM C.Age, 31 years. Enlisted, August 25, 1862, at Volney; mustered in as private, Co. B, November 19, 1862, to serve three years; killed, July 20, 1863, in action, at Tarboro, N.C.
RULISON, JOSIAH.Age, 22 years. Enlisted, September 27, 1864, at Hornellsville; mustered in as private, Co. H, September 27, 1864, to serve one year; discharged, June 23, 1865, under General Order No. 83, etc; prior service in Twenty-fourth New York Volunteers. RUSSELL, ALEXANDER.Age, 22 years. Enlisted, November 20, 1862, at Buffalo; mustered in as private, Co. H, November 20, 1862, to serve three years; no further record. RUSSELL, GEORGE T.Age, not given. Enlisted, December 28, 1863, at New York city; mustered in as private, Co. C, December 28, 1863, to serve three years; discharged for disability, May 26, 1864, from Northern Hospital, at New York. RUSSELL, ROBERT T. H.Age, 22 years. Enlisted, August 30, 1862, at Oswego; mustered in as private, Co. B, November 19, 1862, to serve three years; appointed sergeant, April 23, 1863; mustered in as second lieutenant, Co. F, February 20, 1864; wounded in action, April 17, 1864, at Plymouth, N.C.; mustered in as first lieutenant, Co. C, December 17, 1864; mustered out with company, July 19, 1865, at Raleigh, N.C.; also borne as Robert J. H. Russell, also borne as Robert R. Commissioned second lieutenant, January 8, 1864; with rank from November 5, 1863, vice Sturgeon, promoted; first lieutenant, October 31, 1864, with rank from October 24, 1864, original. RUSSELL, JAMES.Age, 20 years. Enlisted, May 4, 1863, at New York; mustered in as private, Co. F, May 4, 1863, to serve three years; transferred to Co. E, May 20, 1863; mustered out, June 8, 1865, at Beaufort, N.C.
RUSSELL, JOHN.Age, 24 years. Enlisted, August 12, 1864, at Poughkeepsie; mustered in as private, Co. L, August 12, 1864, to serve three years; mustered out with company, July 19, 1865, at Raleigh, N.C.
RYAN, JOHN.Age, 32 years. Enlisted, December 11, 1862, at Hoosick; mustered in as private, Co. B, March 30, 1863, to serve three years; no further record. RYAN, JOHN.Age, 19 years. Enlisted, November 19, 1864, at New York; mustered in as private, Co. M, November 19, 1864, to serve three years; in confinement at time company was mustered out, July 19, 1865; no further record. RYAN, MICHAEL.Age, 21 years. Enlisted, July 21, 1864, at Brooklyn; mustered in as private, Co. C, July 21, 1864, to serve two years; died of disease, February 14, 1865, in Foster Hospital, New Berne, N.C.
RYAN, OWEN.Age, 33 years. Enlisted, July 13, 1863, at Syracuse; mustered in as private, Co. A, July 13, 1863, to serve three years; missing in action, April 20, 1864, at Plymouth, N.C.; died no date given, at Andersonville, Ga., while prisoner of war. RYAN, OWEN.Age, 20 years. Enlisted, July 13, 1863, at Syracuse; mustered in as private, Co. I, September 2, 1863, to serve three years; mustered out, June 8, 1865, at Albany, N.Y.
RYAN, PATRICK.Age, 30 years. Enlisted, in Co. H, July 13, 1863, at Buffalo; deserted, August 26, 1863, previous to muster in of company. RYAN, ROGER.Age, 30 years. Enlisted, December 11, 1862, at Syracuse; mustered in as private, Co. I, March 31, 1863, to serve three years; transferred to Co. B, May 20, 1863; to serve three years; transferred to Co. B, May 20, 1863; mustered out with company, July 19, 1865, at Raleigh, N.C.